This song has nothing to do with Diff'rent Strokes except for the fact that I called the song "Willis". 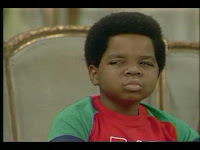 Still, don't you just love the young Gary Coleman? I prefer to think of the entire Diff'rent Strokes cast as they were....so...OK, let's get back to music. Taken from instrumental mopehead volume two this track is extremely long and written during a phase I was going through - which was nearly all instrumental. I lost the desire to write lyrics and thought that if I wrote an instrumental maybe it would prompt me to write words, but in the case with the tracks on instrumental mopehead volume two, that didn't happen (although a couple tracks do have lyrics - vocals just haven't been recorded). Have a listen if you want to dedicate 8 minutes and 22 seconds to this groovy track. Thank you for listening (for those that did) and let me know what you think.